Synchronize your transcripts to recorded deposition video at Lake Cook Reporting. Synchronize video to transcript text with industry-leading software. 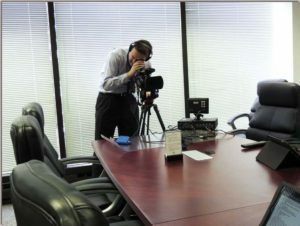 Lake Cook Reporting utilizes a variety of industry-standard programs to synchronize deposition video to transcripts produced by our court reporters. Follow the transcript line-by-line with video, or search specific words and phrases in transcripts to view in the video. Bundled case files allow for one, unified package distributed by court reporting firms containing transcripts, exhibits, documents, and video in one convenient file. Exhibits appear in the transcript as clickable links, allowing users to select and view exhibits. Schedule court reporters and legal video and Request synchronized transcript to video. We Listen To You. Synchronize transcripts to video and let us take care of encoding and file types. We take the guess work out of synchronization. Our team can synchronize your transcript and deposition video along with exhibits into one convenient bundled file. Our files work with popular case management software like Sanction and Summation. We’ll convert video files and transcripts to the proper format for synchronization so you don’t have to. Digital repository, portable bundles available anywhere. Receive your bundled transcript with video and linked exhibits on our digital repository for simple, fast, and secure access from anywhere, anytime. Our bundled software works with a variety of platforms. Use with existing bundle programs like RealLegal e-Transcript Bundle Viewer or YesLaw. Viewer software is available for computers, tablets, smartphones, or as portable apps that don’t require software installation. Synchronize legal video to transcripts, stream it online. 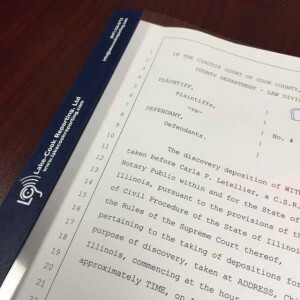 Taped depositions can be linked to the transcript text, allowing viewers to navigate to specific lines in the transcript and see the video response. By utilizing industry-standard synchronization software like YesLaw Sync and West Publisher 5, users can view the video, follow along in the transcript, and create video clips as needed. Combine realtime transcription services with videography to create streaming video/text over the internet to remote parties. With high-tech secure software, view a live deposition and transcript from anywhere on any PC, smartphone, or tablet. Contact us for more information. Call, Email, or Schedule With Us Today. We appreciate your business. Use any of the links below to get more information or schedule services with Lake Cook Reporting. Call us for our office, your office, or anywhere you need us. Use this contact form for any questions or general inquiries. Ready to book? Schedule online right from our website!